For my entire life I have heard my parents reminisce on their first trip to Italy together. They were newlyweds, and my dad’s “Nonno” had asked them to accompany him on one of his annual trips to his hometown Chiavari, a small town by the Cinque Terre in the Liguria region. My dad was extremely close to his Nonno, having lived with him for a significant amount of time in his 20s, and had always looked forward to a day when he could experience Italy with his grandfather. A street in Chiavari. Photo by Joe Cardini. So about 25 years ago, my parents began the journey, sightseeing through Italy with their own personal tour guide in the form of my great-grandfather. My dad still talks about this trip every chance he can get, and being a writer himself, has written about it many times (his most recent rendition of the story can be found here, if interested). 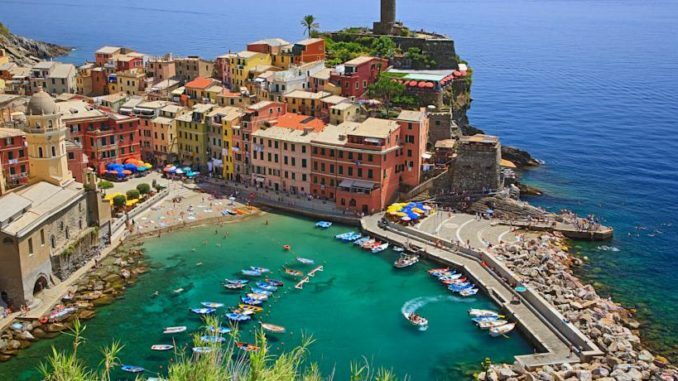 They started in Rome and eventually made their way to the quaint and inviting town of Chiavari. 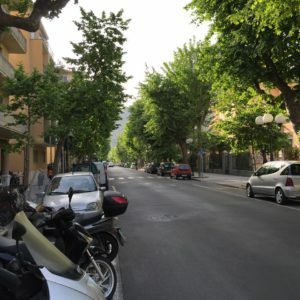 After excitedly showing them around his hometown on their first evening in the city, Nonno said goodnight and promised to meet my parents in the hotel lobby at 9 a.m. the next day. However, the next morning Nonno never came downstairs. At some point that morning my great-grandfather had passed away from heart failure. My dad remains convinced to this day that the purpose of this trip was to fulfill his Nonno’s wish of passing away in his hometown. As shock and grief settled upon my parents, they learned that there are laws regarding the transport of a body overseas; they were forced to remain in Chiavari for the next ten days. But to make light of an unexpected situation, my great-grandfather’s family – who barely spoke English and had never met my parents before – took them in. Our cousin Francesca invited them to stay in an extra room in her apartment, and somehow my parents found solace among these family members who were essentially strangers. The language barrier didn’t matter, as they laughed and shared stories over many meals together. Francesca even showed them around other cities in Italy. 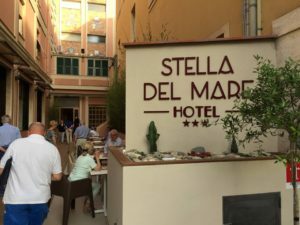 The hotel Nonno passed away in. Photo by Joe Cardini. Naturally, growing up hearing this incredible story, I had longed to visit Italy for most of my life. Being “100% Italian” was something that was well celebrated in my family – my uncles always joked that my cousins and I were only allowed to marry other full Italians, and we were taught to be extremely proud of our heritage. So when the opportunity arose for me to study abroad in college, there was no question of where I was going. Once I decided to study abroad in Florence, the first thing I asked my dad was whether it would be possible for him to come to Italy with me, and if we could visit our family members who took him in on his incredible journey 23 years earlier. I couldn’t imagine experiencing the place that meant so much to him without him by my side, and I had dreamt of meeting my extended family for years. 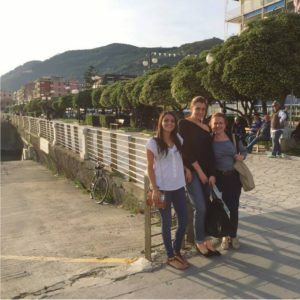 Me, Francesca and Mariella on the boardwalk in Chiavari. Photo by Joe Cardini. We flew into Milan, over two years ago now, in May of 2015. After spending one night in Milan, we traveled the next morning by train to the tiny town of Chiavari. I stepped off the train onto the platform and was immediately greeted by a woman I had never met, who embraced me and exclaimed, “Ciao, bella!” She is one of my cousins, Mariella, and was accompanied by my other cousins, Guise and Francesca. After many enthusiastic greetings and introductions, we set off on foot for a tour of the town before settling at Mariella and Guise’s house for a home cooked meal of several courses. First came spaghetti with clams accompanied by white wine. Fresh bread was served in between courses before we were served shrimp cooked in breadcrumbs and a cannellini bean paste with olive oil and fresh rosemary. Dessert involved 6 different kinds of gelato accompanied by a dessert champagne and, finally, shortbread cookies with limoncello. My very first night in Chiavari is cemented in my memory by how incredible the food was. In true Italian fashion, the meal served as an ice-breaker and bonding experience for all of us. Our cousins barely spoke English and my dad and I spoke very little Italian, but somehow, the language barrier was broken over dinner. Many laughs were shared as we talked about everything under the sun from memories of my dad’s Nonno, to my study abroad trip, to politics. I was amazed at how quickly I was able to find connections with these people I had never met and who didn’t even speak the same language as me. While experiencing it, I couldn’t fully process what it meant to transcend time and explore our family, our history and our heritage with my dad. We walked the very streets he had walked with his Nonno 23 years prior, visited the hotel his Nonno had passed in, ate dinner around the same table he and my mom ate at countless times with Nonno’s family members in the aftermath of his passing. We even stayed in the same room in Francesca’s apartment that my parents had stayed in on their trip. We were strangers thrust into each other’s lives but brought together by the pillars of Italian culture: family and food. 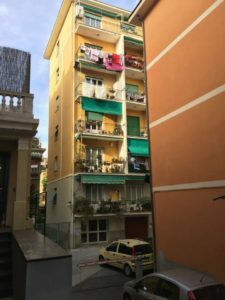 In those moments I felt like I belonged there, recognizing pieces of my own personality not just in my family members but in Italian culture and the Mediterranean way of life. 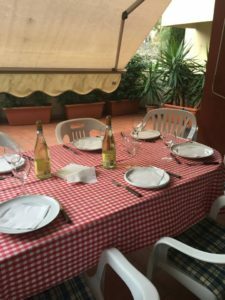 The days that followed involved many more home-cooked meals, adventures through Chiavari, and connecting with my extended family members. After three days it was time to say goodbye, and my dad and I traveled to Florence, where I would be studying abroad for the next six weeks. I could write a hundred more articles about my time in Florence, but those are stories for another time. Experiencing Italy with my dad is truly one of my favorite memories to date. I have never seen him so happy and passionate about a place and culture, and even more so to share it with me. I learned so much about myself and where I come from and have never felt more at home in a foreign place. I left my heart in Italia, and have been counting down the days until my return.